Source: Clutch.co | "How Small Businesses Invest in Digital Marketing in 2018"
When most people think about augmented reality and virtual reality (AR/VR), they think first of video games, like the VR version of Skyrim or Niantic’s AR smash hit, Pokémon Go. But AR/VR technology has other applications, too. One of the most promising? Bringing real spaces to virtual life. AR/VR experiences let people inspect a hotel room that’s thousands of miles away so that they can decide whether they’d like to book a stay. They let customers walk around a virtual Rebecca Minkoff store and buy clothes. And they allow prospective renters and homeowners the chance to see what a house is really like. 12% of small businesses plan to invest in AR/VR marketing in 2018. It’s clear that AR/VR digital marketing is a trend that forward-thinking companies are capitalizing on now. Programs like Amazon’s Sumerian and Apple’s ARKit have already brought AR/VR experiences to users - and this is just the beginning. 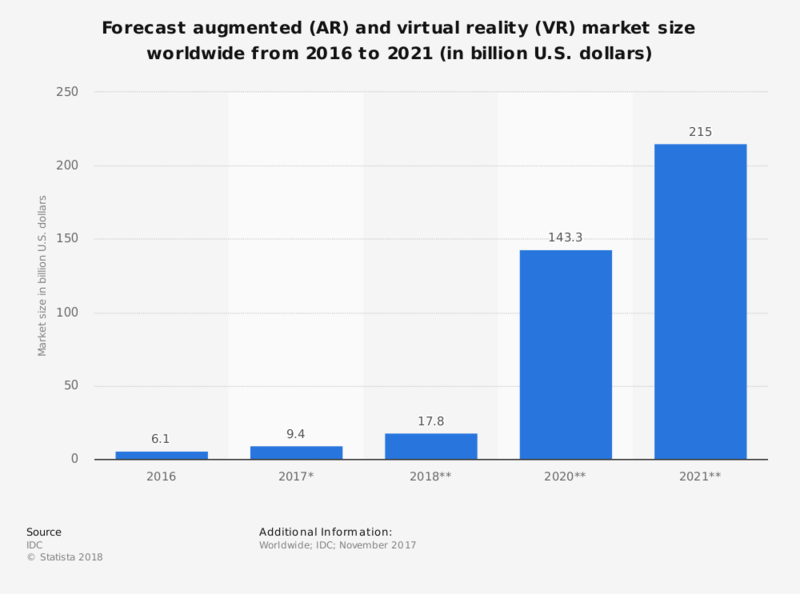 According to Statista and NewGenApps, the global market size of the AR/VR market will be $143.3 billion by 2020. House in Motion uses VR technology to build property tours, which those with a VR headset can view; as well as 360-degree video tours, which don’t require a headset. Bozkurt started offering these tour options in 2016, when he and his team saw that virtual reality was an up-and- coming real estate technique. The moment Derrick first tried a VR headset, he saw the business potential, he said. “You can talk about VR all day, but until you throw a headset on and view high-quality content, you haven’t seen what VR can do. It’s going to change a lot of industries - real estate is just one of them,” he told me. A VR tour means showing a house in all its assets and flaws, though. Clients know what they’re getting and can better prioritize the properties that stand out to them. What’s more, touring houses takes time for the realtor, the prospective owners, and the current owners. Sometimes syncing all those schedules is a near-impossible task. VR tours cut down on the need for as many tours, which saves gas money and time stuck in traffic. “For buyers, VR tours are a huge help. For sellers, tours are great because they give sellers the ability to market their property in a whole new way,” Bozkurt said. In 2018, it’s crucial for businesses of any size to consider whether AR/VR marketing would be able to bring the same unique edge as the technique has for House in Motion. But the most important part of moving forward with an AR/VR experience, said Derrick, is whether it brings any real value to the consumer. Companies shouldn’t create VR apps just for the novelty; they should come up with apps that provide consumers with experiences they couldn’t otherwise have. “Focus on what’s really valuable [to the user],” Bozkurt explained. Since AR and VR headset sales are set to jump 50% in 2018, it’s worth investigating what AR/VR marketing could bring to your business. Elizabeth Ballou is a content developer at Clutch, a ratings, reviews, and research platform in Washington, D.C. She writes about digital marketing and HR. When not writing, she listens to too many podcasts and dreams of owning a VR headset of her own.